The history of our certified Century farm dates to 1892, when Henry Mecker, whose parents were immigrants from Germany, bought an original 40-acre plot here. The farm grew over Henry’s lifetime and by his death in 1935 had been divided into two parts, which were owned by his sons John and Fred. Perryville Pumpkin Farm sits on both of these farms. John Mecker’s farm passed to his son Elmer, and then to Elmer’s son Marvin, who was born on the farm and still lives there today with his wife Eleanor. Marvin and Eleanor Mecker’s daughter Dianna Koenig, who grew up on the farm, today runs Perryville Pumpkin Farm with her family. Dianna’s husband Brian, who grew up on farm in Farrar, Missouri, in East Perry County, is now a full-time farmer with the Mecker family farm, growing corn, soybeans, and wheat on 750 acres in Perry County, mostly in the Mississippi River bottoms. Fred Mecker’s farm is also still owned by his descendants, who no longer live in Perry County. In 2008, Brian & Dianna began renting this farm, and it became part of Perryville Pumpkin Farm in 2009. The Mecker farm at one time was home to more than just grain crops. Like most small farms, for most of the twentieth century the farm was more diversified, with cows, chickens, and hogs to provide milk, eggs, and meat for the family. 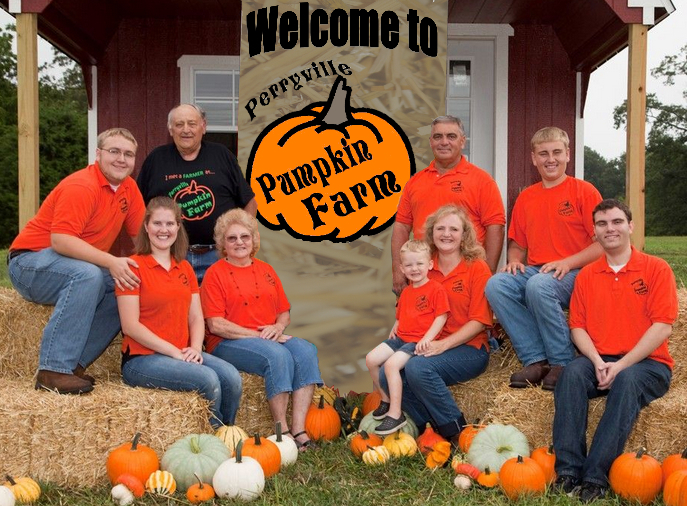 Brian & Dianna began Perryville Pumpkin Farm in 2001 as a way to expand the farm operation that could include their three sons, Tyson, Jarod, and Ryan. The retail pumpkin operation began with just selling small pumpkins from wagons in the yard, along with the straw bales we’ve always sold year-round. We used an old paint can to accept payment on the honor system. Within a few years we added a straw tunnel for kids, and began selling corn stalks and Indian corn as well. We started giving wagon rides to the patch for school groups at the suggestion of a local preschool teacher, and soon were giving them to the public on weekends too. Animals at the farm began through Ryan’s 4-H projects. Through the years we increased the variety of products we offer, eventually growing into the more than 150 varieties of pumpkins, gourds, and squash we plant today. Perryville Pumpkin Farm has always been very much a family operation—in our early years, all 5 Koenigs could be found in the patch picking pumpkins nearly every day after school in September and October, and selling them on the weekends. Jarod coordinated much of the operation himself while he was in high school, laying much of the foundation for how we still do things today. After he left for college, Dianna took over the day-to-day operation of the pumpkin farm. The past few years have seen significant growth, including the addition of the corn maze, two gift shops, mini-golf course, pumpkin bowling, and more. Our good friends Dan and Laura Miesner and their daughter Lydia now help us on the farm when visitors arrive, especially on weekends. We sell Laura’s line of homemade jams, jellies, produce and handiwork called “Naturally Laura’s.” Educating the public about agriculture has become an increasingly important part of our mission through the years. The boys have remained heavily involved in the pumpkin farm, even as Tyson and Jarod have moved away from Perry County. Jarod designed and constructed the mini-golf course and designs our corn maze every year, and is the primary force behind implementing most of our new activities. Tyson is the primary manager of our online presence as well as the main “host” for weekend wagon rides. Ryan helps Dianna pick nearly every pumpkin we grow, and is Brian’s right-hand man on the farm in general. He plans to transition to a full-time role with the family operation after finishing school. Daughter-in-law Jennifer, who grew up on a fruit and vegetable farm in the Missouri Bootheel, has been part of the operation since even before she married Jarod. Their son Benjamin and daughter Rebekah are now the seventh generation of our family to be part of the farm. Perryville Pumpkin Farm is the biggest reason that our whole family comes home to the farm every year. On October weekends you can still often find all the Koenigs on the farm selling pumpkins, giving wagon rides, and much more. We’ve made many memories as a family on the pumpkin farm and work hard to help you do the same year after year. From our family to yours, have a great time at the farm!